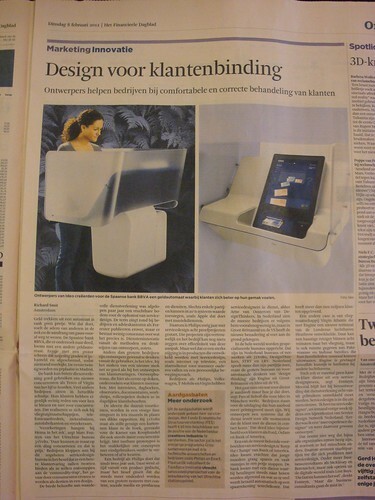 The renowned Dutch newspaper “Het Financieele Dagblad” (which is the national equivalent to the financial times) wrote an article about the uprise of service design as a way for companies to work on their customer loyalty. In preparation for the article I had an elaborate conversation with the author over a cup of coffee. I’m very happy with how the article turned out. The writer managed to focus on the economic incentives, and they are very clear in service design but often vaguely communicated. Companies are knocking on the door of service design agencies in the knowledge that they will have to provide a better customer experience in order to escape the “commodity trap”, the danger to be perceived by consumers as indistinguishable.